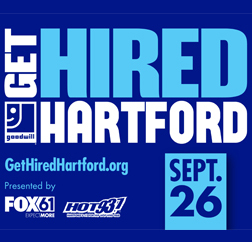 GET HIRED HARTFORD – a hiring event by Goodwill of Western and Northern Connecticut, is the largest free career expo in the state! With resume professionals onsite to help refine your resume, a chance to get a free, professional LinkedIn headshot, over 80 employers to meet and network with and more, you will find a multitude of resources to help you obtain your next great role. Employers on hand will be hiring for thousands of open positions. Get Hired Hartford is your chance to take your career to the next level. Whether you’re just out of school, seeking entry level work or are seasoned professional – there is something for everyone. Do you need to brush up on your interviewing or networking skills before the event? Maybe you want some pointers on how to dress for the big day – Stop by a Goodwill Career Center and we will prepare you to make a lasting first impression.